What's behind the "WALL-E" cult? Is Pixar's Chaplin-meets-Kubrick robot romance really the best animated film ever? Plus: Answers to our "Sukiyaki Western Django" quiz revealed! "What in the world were they thinking?" my wife asked as we watched the closing credits of the Disney/Pixar robot-adventure flick "WALL-E," which is new this week on DVD. Then she answered her own question: "They were thinking, 'We're Pixar, and we can do whatever we want.'" Fact is, if that's what co-writer and director Andrew Stanton and the rest of the Pixar crew thought, they were right. For all its strangeness -- for all that it's an apocalyptic, deep-future satire, whose reference points include Chaplin, Keaton, Kubrick and a bunch of sci-fi classics the kiddies presumably haven't seen -- "WALL-E" in no way derailed the digital-animation giant's success train. After grossing $220 million-plus in theaters, which is mediocre for a Pixar film but pretty damn impressive for anybody else, this odd, nearly silent film arrives on the retail scene in a deluxe three-disc DVD or Blu-ray set, just in time to be a hot item in a severely depressed gift-giving season. It's all a bit too appropriate, if you ask me. Here's a movie whose protagonist seems to be the last functioning machine on a thoroughly poisoned planet (ours, that is), and which depicts the planet's self-exiled humanoid species as a race of boneless slugs on permanent vacation, each one imprisoned in his or her personal media bubble. 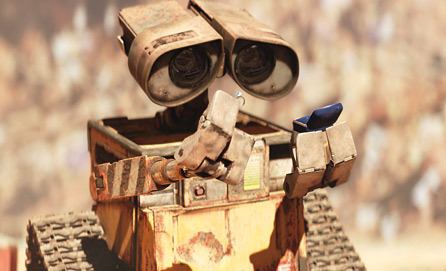 Sure, WALL-E is a cute little fellow with a wistful yearning for better days, something like a pair of binoculars atop a trash compactor, but with roughly the personality of Chaplin's "Modern Times" character. (His love object, the life-seeking robot EVE, simultaneously resembles a vacuum cleaner and an iPod.) And it's all OK in the end, in highly implausible fashion. None of which conceals the fact that "WALL-E" is a mordant downer before it chickens out, a flick that channels the grim future-world scenarios of "A.I.," "2001" and "The Matrix" (among various others) and then pretends to be kidding. See, "WALL-E" is something more peculiar than another animated hit for the junior set; it's an animated hit with something approaching a cult following among cinephiles, hipsters and bloggers. At its release, or so one Disney source tells me, it tested better with adults than with kids, and it probably isn't 9-year-olds who've pushed "WALL-E" to No. 33, the highest position of any animated film, on IMDB's Top 250. Ever since it came out, I've been hearing murmurs about it being so-and-so's favorite film of the year. This is beyond contrarianism and about two-thirds of the way to critical consensus. On the one hand, that's cool. Like all contemporary parents, I love Pixar, because its movies ingratiate themselves to adults without condescending to children. "WALL-E" is an admirably ambitious little movie, even if no film with a reported budget of $180 million should be called little. It would probably both bore and terrify my 4-year-old twins, but a lot of older kids (and their in-the-know aunts and uncles, it seems) have obviously responded to its blend of pathos, terror and comedy. If it nudges even a handful of those millions of viewers back toward its source material, and the whole comic-surrealist-apocalyptic tradition it tries to synthesize, that can only be a good thing. On the other hand: WTF? "WALL-E" is a cartoon, dammit. It's a pretty good cartoon, one that blends together a lot of half-baked themes from more serious works of film and literature into a clever pastiche flavored for today's kidult tastes. I liked it fine, and the overreaction in some quarters is not Pixar's or Stanton's fault. But don't insult our intelligence by claiming that it's the best movie of the year or the best animated film ever made or a masterpiece or a mantelpiece. It might be the third-best Pixar movie of the decade. Which, hey, is not nothing. In more DVD news -- and this is me sneaking the dessert in after you've eaten your vegetables -- this week also brings us the release of one of my favorite foreign films of the year, Takashi Miike's indescribably weird Japanese western "Sukiyaki Western Django." Made in English (approximately) with a predictably great-looking Japanese cast and a peculiar supporting performance from Quentin Tarantino -- I mean, what would you expect? -- it's a bravura blend of Peckinpah and Kurosawa. Now then! First Look Studios has supplied me with one giveaway copy of the "Sukiyaki Western Django" DVD in a "collectible Steelbook," and no, I didn't know what that was either until I saw it. Thanks to everybody who submitted responses to the quiz! We've now got a winner: Round of applause, please, for Douglas Hickey of Sierra Vista, Ariz., who filed the first 100 percent correct-amundo response and takes home the disc. Answers are now appended below, so if you want to play along at home, just read the rest of the page carefully. 1. On which Shakespeare play is "Sukiyaki Western Django" partly (if pretty loosely) based? 2. What historical conflict is depicted in that play? 3. Miike's film is also partly based on a historical Japanese clan war. Name the warring clans and the century in which their famous feud occurred. 4. In which American state does the action of the film take place, at least nominally? Extra-credit tiebreaker: Japanese actress and jazz singer Kaori Momoi plays a legendary female gunfighter in "Sukiyaki Western Django." A few years ago she appeared in an earlier Takashi Miike film, also a period piece. What prominent Japanese actor and filmmaker co-starred in that film? 1. This turned out to be the toughie. People suggested pretty much all the Henry plays, but Miike's movie has nothing to do with the Battle of Agincourt ("Henry V") or the crown's split with the Catholic church ("Henry VIII"). It does, however, borrow situations, a color scheme and snatches of dialogue from "Henry VI, Part One." 2. That play depicts the late-medieval War of the Roses, and the warring clans in "Sukiyaki" are sometimes called the Reds and the Whites. 3. As almost everybody got right, Miike is also depicting the Genpei War (aka the Heiji War) of the late 12th century, between the Taira (or Heike) and Minamoto (or Genji) clans. Medieval Japanese history is too damn complicated already, and then they have to keep changing the names. 4. It's Nevada, although I've spent a fair bit of time traveling the desert back roads of the Silver State without ever seeing that town. Everybody got the extra-credit question right, I guess because all it took was a couple of clicks on IMDB. Momoi was in Miike's 2004 film "Izo," along with actor and director Takeshi Kitano, aka Beat Takeshi.